Create incredible logo designs that look like a Photoshop guru spent hours laboring over! It's like having your own logo design studio... without the studio! With The Logo Creator logo design software - you'll get a portfolio full of logo designs that you can modify and customize yourself... for far less than what a logo maker will charge. ALL of our logos in one huge easy to install package! Over 380 professionally designed logos that you can mix, match and manipulate ... in minutes! 380 logos, over 800 logo elements to mix, match and manipulate! All you need is a jump off point, and a little creativity. Dozens of logos can be made from just one template. You can also use The Logo Creator to create web page headers, titles for your Movies, and your business cards! Are you looking for a professional logo design company but don't want to pay hundreds, or even thousands, for this type of service? Are you a webmaster or graphic designer who wants to provide professional logo design services to your customers? 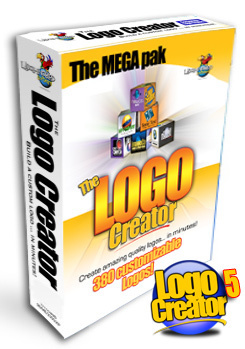 Are you an entrepreneur who wants to make a living SELLING the logos you design with The Logo Creator? Do you simply want to spruce up your current site with professional graphics? Are you determined to get a professional logo but don't want the hassle that a design firm may put you through? Looking for a way to provide logo design services to your clients?